In February 2013, Hoffman Environmental Research Institute staff member and graduate student Jonathan (Joneo) Oglesby journeyed to Niger, West Africa, to conduct preliminary thesis research with the Songhai people. 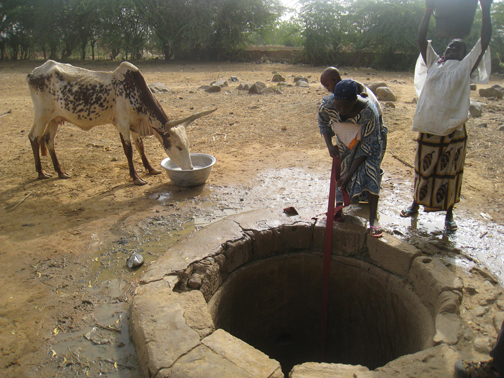 Women fetch water from a community well, shared by people and animals alike, in Bouban village. The focus of the trip was to gain a better understanding of how the Songhai cope with the water cycle, sterilization of water, water sanitation and water hygiene. Oglesby conducted surveys and interviewed workers in remote villages along the Niger River. The data acquired will be used as the foundation for future thesis work that will include the creation and dissemination of water education materials for the Songhai. The goal is their eventual dissemination to other Least Developed Countries in the region and around the world, including to a second study site at Gales Point, Manatee, in Belize starting this summer. Through his research, Oglesby is working with his advisor, Dr. Leslie North, to develop and evaluate successful avenues for informal education practices in improving water education in these communities to promote sustainability and water resource protection, as well as to improve economic and educational opportunities through capacity building. He will use data visualization techniques incorporating science and art to cut across culture, language and geography to teach these communities about water sanitation and conservation. 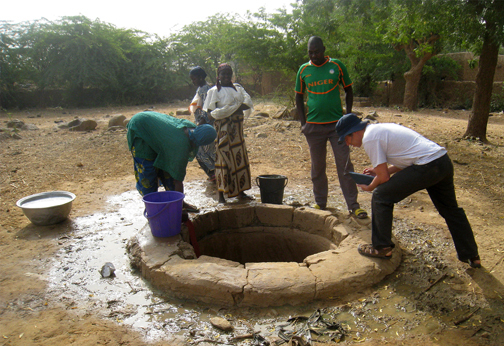 Jonathan (Joneo) Oglesby interviewed the Songhai people at a well to learn about water usage. Many of the women Oglesby interviewed during this initial research trip spoke of the daily arduous task of carrying water to and from the river to their homes, often starting before dawn and not finishing until after dark. Some even explained it’s as if they never stop. Most gather water from sources that are heavily used and negatively impacted by people and animals. The water is then used without any treatment for consumption. For many communities in Niger, water collection takes up so much time that women and children are often unable to find time to go to school or work to support their families. He is starting a website, www.fofohari.org, as the foundation for an organization to address water education for developing countries. The educational tools developed and created for this research will be disseminated through this site, and it will be used to further communicate techniques for water education in developing areas. 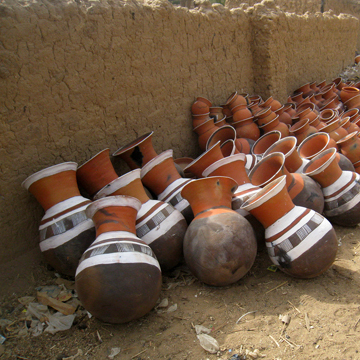 Dozens of colorful water storage pots near the outskirts of a village. These are for sale, but rarely seen in homes due to their high cost. Dr. North, Associate Director of the Hoffman Institute, said: “Joneo’s research embodies the true spirit of integrating science and education to make a difference in communities. The geography of water education is understudied, and certainly of pressing importance as water resources diminish in the face of population growth and climate change. “This will be a great step in working to develop and study effective informal education tools aimed toward understanding how to overcome these spatial and cultural differences,” she said. For information about the project, contact Jonathan Oglesby at jonathan.oglesby@wku.edu or Dr. Leslie North at leslie.north@wku.edu. Contact: Leslie North, (270) 745-4555.